The challenge for Greening Beeston in December 2012 was to have a tree with as low a carbon footprint as possible. Without the lights our tree has 0 carbon emissions, because it is made from small branches from a local tree and decorated with recycled items and natural objects. LED lights were chosen, because they use much less electricity than normal lights, in this case 0.8 watts. We hope other people will be inspired to make their own decorations and use LED lights. Making a tree is a bit more difficult but the pictures on the right show how we did it, using an idea found on the internet. The first stage is to support a pole, e.g. an old broom handle, using something like a parasol stand. Then add cardboard tubes, such as toilet roll centres, with holes in them and push the branches into the holes. The top branch needs to be tied on to keep it straight. Then add the lights and recycled and/or natural decorations (e.g. sweet papers bottle tops, orange peel, berries, pine cones - use your imagination). Or use decorations saved from previous years. The group had fun making the decorations, some with green messages on them. Inspired by an idea found on the internet, Greening Beeston decided to make a ‘green’ Christmas tree, which is on display at Beeston Parish Church’s Christmas Tree Festival. The Festival is from 14th to 17th December 2012 and the trees remain in the Church until after Christmas. So why not pop in to see all the trees and see what you think of Greening Beeston’s efforts? May be you will be inspired too. Have you ever thought about the waste and costs to the environment associated with Christmas trees? Growing and transporting them here already causes CO2 emissions and there are more involved when they are disposed of. The decorations also have an environmental impact, although keeping them from previous years reduces that, but making your own from unwanted items costs nothing at all. The Greening Beeston Campaign was successfully launched in October and their ‘leaf’ cards have been distributed and counted. Now the group is waiting to hear how much CO2 and money are being saved by the people who made changes in their use of fuels and water. Meanwhile, as a break from campaigning, they decided to take on the challenge of making a Christmas tree with very low environmental impact. 3. All finished apart from the angel. 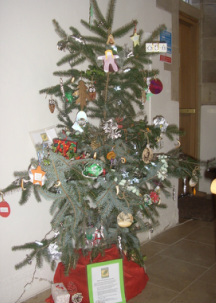 The Christmas tree was constructed using branches cut from a tree growing in a local allotment, so that there is no carbon footprint associated with the growing, transporting and disposing of the tree. (The branches were composted afterwards.) For decorating the tree the group have had fun using recycled items, such as sweet papers, chocolate wrappers, bottle tops, orange peel, berries and pine cones, and the results are still attractive without any cost involved. The only cost was the electricity for the lights but that has been reduced by using LED lights, which use much less electricity than ordinary bulbs. 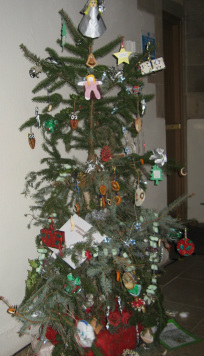 The Christmas Tree Festival was from 14th – 17th December 2012 in Beeston Parish Church. Will you will be inspired to make your own Christmas tree, or at least try making some recycled decorations for next year? 1. Adding the first branches. 2. Tree complete, waiting for decorations. 4. Now complete with angel on top.